in most cases EMF is probably one of the simplest Regulations to comply with. If it seems complicated, time consuming and expensive, you're probably doing it wrong. We have a simple three step approach to ensuring your risks due to EMF are addressed. 1. Assess where there may be a risk and to whom. 2. Quantify or measure the EM field. 3. Sign off or solve the issue. Thats it! It couldn't be simpler. Many of the tools we use can be used by yourself without the need for our engineers. However when you do need help, you know we will be there for you with simple solutions. Electromagnetic fields (EMFs) arise whenever electrical energy is used. So for example, EMF arise from work processes such as RF heating, welding and in the world at large from radio, TV and Telecoms equipment. What has it got to do with me? Countries that are members of the EEA (Like the UK) will bring into force Regulations necessary to comply with the Directive by July 1st, 2016. This is a Regulation we will have to comply with. The EU published a Practical Guide in 2016 and HSE, is continuing to work with stakeholders to develop UK Guidance and puwer compliance. Since the late 1970s, questions have been raised whether exposure to these extremely low frequency (ELF) electric and magnetic fields (EMF) produces adverse health consequences. Long term exposure to high levels of EMFs can give rise to acute effects. The effects that can occur depend on the type of RF energy. At low frequencies, it affects the central nervous system of the body. At high frequencies, heating effects can occur much like they do from a microwave oven. Those heating effects leading to a rise in body temperature. What do I need to know as an employer or manufacturer? This directive (2013/35/EU) replaces the previous directive 2004/40/EC and became law in Europe on 1 July 2016. This Directive applies to all industries, but will have the greatest impact on the welding and consumer goods industry. RF, spot and other types of welding equipment generate significant magnetic fields. As an employer, you will need to make an assessment of your employees exposure to EMF. Unfortunately, EMF is not something you can see, feel or touch so it is impossible to quantify the nature of that exposure without special test equipment. So after testing, if the exposure exceeds the limit values, you will need to develop methods of reducing that exposure. Those methods of controlling exposure may include employee information and training, health surveillance or shielding. The main processes likely to be affected are resistance welding, some arc welding processes, RF welding, induction heating and brazing magnetic Particle Inspection. If you feel that you will fall under this Regulation, then you should act now. The HSE advised businesses to have a plan in place by 2015 and that plan to be ready for 2016 when the law came into effect. A large part of that plan will be risk assessment and EMF measurement with guidance taken from standards such as BS EN50499:2008 (Procedure for the assessment of the exposure of workers to electromagnetic fields). MSCS can put that plan together for you if you wish and provide information, guidance and testing services. Simply put, we will look at your equipment and site layout and put together a test plan on your behalf. This could be individual items of plant, perimeter surveys or combinations of the two. We then carry out that testing and give you advice and assistance on corrective measures. And as always, we will match or beat any quote for equivalent services. MSCS Ltd has invested heavily in test facilities and equipment. In 2014 we opened our new Open Area Test Site or OATS with great success. 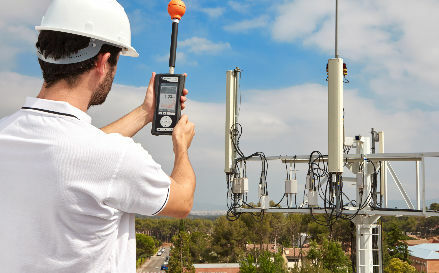 In addition to the comprehensive EMC test services, we also provide EMF measurements, site surveys and assessments for a wide range of industrial and commercial equipment. Our test and evaluation services covers most industry sectors including automotive manufacture, welding, household appliances and RF equipment. Assessment of electromagnetic fields (EMF) like EMC, can be an essential part of compliance in CE marking. We offer EMF related testing and assessment in accordance with the EMF Directive (2013/35/EU) and European recommendation 1999/519/EEC for human protection to exposure to magnetic fields. Bespoke training packages to suit your business dependant upon the level of detail you require. Useful and free to download information to help you and your company with compliance.